On January 24, 2018, the most powerful high-voltage direct-current (HVDC) transformer began its journey from the transformer factory in Nuremberg, Germany, to China. The transformer will first be transported to the harbor in Nuremberg by special heavy load transporter, where it will be loaded onto a ship. Its journey will take it to Rotterdam via the Main-Danube Canal, and from there it will be shipped to China, where it will arrive after several weeks on the high seas. In July 2016, Siemens received an order to manufacture four transformers of this type. About a year later, the world’s first 1,100 kV transformer was completed and successfully passed the tests in the testing facility. The enormous dimensions of the transformer – 37.5 meters long, 14.4 meters tall, and 12 meters wide – posed a logistical challenge for the team. In operation, the transformer weighs just under 900 tons and its efficiency is well above 99% of the rated power. For the first time, the transformer will enable a high-voltage direct-current (HVDC) transmission with low losses over a record distance of 3,284 kilometers with a transmission capacity of 12 gigawatts. HVDC transformers are part of the converter station that convert alternating current into direct current at the beginning of the transmission line and convert it back again at the end of the line. The conversion from alternating current to direct current helps to transmit energy over long distances with low losses. 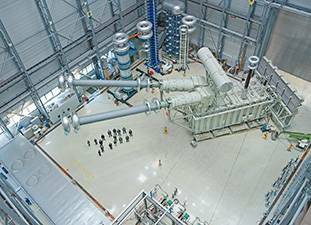 Transformers are key components of an HVDC line: Thanks to the transformer, the Changji-Guquan project will be able to transmit direct current with a huge 1,110 kilovolts for the first time in the world. The new transformer not only makes the transmission of this record voltage level possible, but it is also the world’s most powerful tested transformer with a capacity of 587 megavoltamperes. Siemens has thus achieved a new dimension in high-voltage direct-current transmission. The HVDC line between Changji and Guquan will be operated by State Grid Corporation (SGCC), a Chinese grid operator. The connection is expected to begin operation in 2019. The world's first transformer, which Siemens developed and manufactured for high-voltage direct-current (HVDC) transmission systems with what is currently the highest transmission voltage of ± 1,100 kilovolts (kV), recently passed its type test. Siemens developed, manufactured and tested the HVDC transformer in its transformer factory in Nuremberg. Together with local partners Siemens will deliver the world's first 1,100 kilovolt (kV) converter transformers for the world's largest and first high-voltage direct-current (HVDC) transmission link, which has a transmission voltage of 1,100 kV DC. They are also the most powerful converter transformers in the world, with a capacity of 587.1 megavoltamperes (MVA).